Formed in 1999 by frontman/guitarist Tommy Boyce, a passion for Stiv Bators, Paul Stanley, and everything in between, birthed stompers “Nasty”, “10 Outta 10” and “Shake It”. Nine weeks in Europe and the USA followed, completed by a stint at SXSW in Texas. 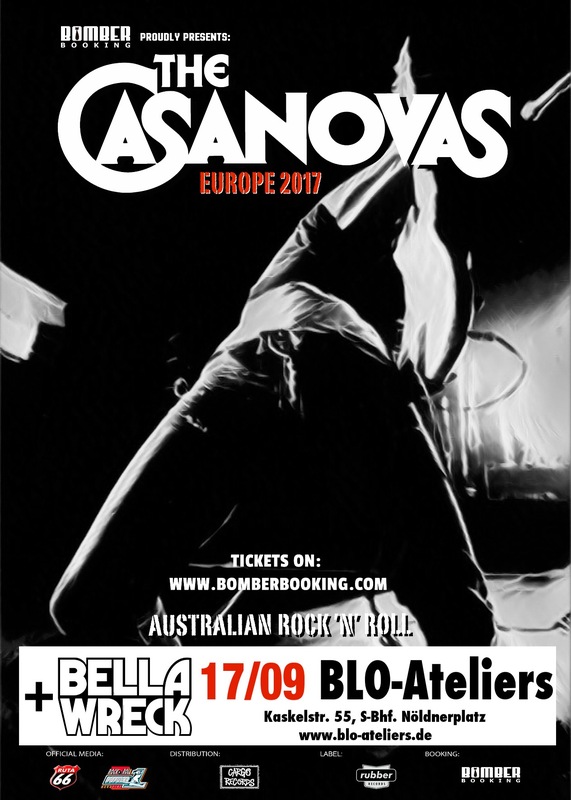 Debut The Casanovas  hitched them to national tours with Motorhead and The Darkness, while All Night Long  paired them with The Black Crowes, Airbourne and Redd Kross. Retaining the core of their visceral, riff driven sound, Terra Casanova’s exploration of rock fused with pop elements, elevated by their maturity as a band, marks it their most varied release yet. Bella Wreck came to be when two like-minded guitarists convened at the bar of a dimly-lit Kreuzberg watering hole to lament the state of rock’n’roll in this great capital of ours. Their idea was to combine the energy of late-seventies punk-rock, the intensity of Detroit’s finest and the guts of classic Australian rock. Seeing no reason to waste time, a rhythm section was formed, songs were written and recorded, shows were played and a first album released. Word is quickly spreading from the late-night bars of Kreuzberg that this new band is destined for the world stage. See them now and remind yourself what hot, sweaty, fun rock’n’roll is all about.